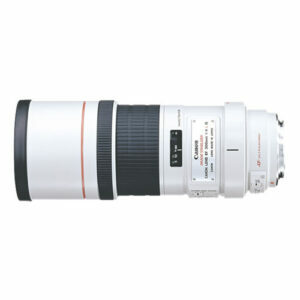 Lens Description: Compact L-series telephoto lens with an Image Stabilizer which compensates for camera shake with the equivalent effect of a shutter speed two stops faster. Two Image Stabilizer modes are provided: Stabilizer Mode 1 (the same mode featured on the EF 75-300mm f/4-5.6 IS USM) and the new Stabilizer Mode 2 which steadies the image during horizontal or vertical panning. Mode 2 detects the panning direction automatically. The closest focusing distance is 4.9 feet (1.5 m).